It may be that you have an existing roof design which is at a low pitch, and you’d like to change the specification to Zinc. It may be that you have an existing roof that is shallow pitch, or even was flat, and you’d like a zinc roof instead. It may even be that you have less height than you thought you had – in which case follow Steve Cleminson’s advice about designing from the roof down – it really does save you anxiety later! Whatever your reasons, people all seem to want to know – what is the minimum pitch for a zinc roof? 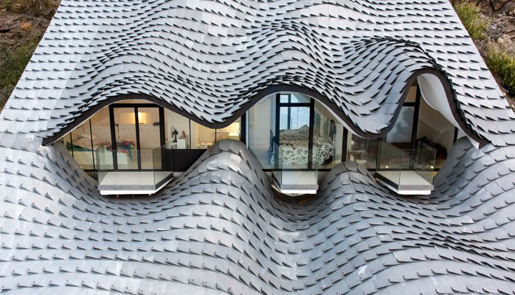 What is the minimum pitch for a zinc roof? SIG Zinc and Copper recommend that the minimum pitch for a standing seam zinc roof is five degrees, with an absolute minimum of 3 degrees. We recommend 5 degrees, however, due to site conditions and execution. A 3-degree roof pitch means just over 50mm in every metre, so over 3 metres you only have 150mm to play with. A 5-degree roof pitch means nearly 90mm in every metre, which gives you over 250 mm to play with, and that extra 10cm is quite a lot on site. An architect may want to choose 3 degrees for a number of reasons, and will design the roof accordingly, usually over a timber substructure, which on site will settle a little. Positioning joists in brickwork on wall plates is more difficult to do accurately on site than it is on a drawing. As a result, we’ve been on site with a pitch finder and found a 3-degree roof was installed at 1 degree pitch. Not intentionally, but simply according to the nature of the beast. What’s wrong with having the roof pitch too low? The problem with low pitched standing seam roofing is the risk of water ingress in the seams. Standing seam roofing has standing seams – as the name implies. During heavy rain, water can build up at the roof to the level of the overlap on the standing seam and this can cause the water to be sucked into the construction via capillary action. Normal traditional standing seam is 25mm in height before it is folded. When you turn your standing seam over, 10-12mm is the rolled material, so your clearance point until there is a risk of capillary action is 13-15mm. If you get a deluge of water across a seam it is easy for the water level to raise to that height, even if only briefly. OK, So What’s your Advice? So here is a summary of our advice about the lowest pitch for standing seam zinc roofing. Make your pitch 5 degrees minimum if you possibly can – it will save you stress later. Specify a seam sealing tape between the seams. This will mitigate any capillary action, but it won’t prevent it entirely. Try and find some more height in your construction – you might only be looking for 100mm. Consider an alternative product. How about single ply membrane with seam profiles? If you can’t do it in metal, we can do it in membrane. Membrane is cheaper, looks great and doesn’t have the restriction in pitch – it can go down to one in 40, which is 1.4 degrees! Contact us about your Standing Seam Roof. It pays to speak to the experts. Read an Introduction to Standing Seam Roofing from our friends at elZinc. Read about single ply membranes with standing seams – product page here, a cottage in Jersey using Rhepanol fk and standing seam, and Guildford Crematorium using the same but with a copper finish. Read about Angled Standing Seam Zinc Cladding – something else you can do with Standing Seam! Ready to talk to us? Do it now!